By this time I wanted my Mummy and Daddy and to be back in that little terraced house all together again. Later, in a strange cold bed at the end of that long weary day, I hid under the bedclothes and cried. 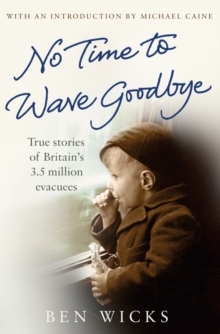 No Time to Wave Goodbye follows the untold tales of some of the 3.5 million evacuees whose lives were suddenly and unforgettably shaken by the upheaval of war. Wicks weaves together the adult memories of children who went to school as normal only to end their day in the homes of complete strangers, within the alien landscape of the English countryside. Unknown to many of them it would now be years before they would once again be reunited with their loved ones. No Time to Wave Goodbye paints a startling and often heartbreaking picture of the evacuees' war.